VietNamNet Bridge - 2017 is the first year Vietnam gained a 2-digit growth rate in wooden furniture exports thanks to heavy investment in technology and design. According to GDC (General Department of Customs), the export turnover of wood and woodwork in the first nine months of the year reached $5.55 billion, an increase of 11.3 percent over the same period last year. Meanwhile, according to the Handicraft and Wood Industry Association of HCMC (Hawa), Vietnamese companies usually export more in the last months of year. Therefore, it predicts the total export turnover in 2017 will reach $8 billion, or 14 percent higher than 2016. In 2016, the export turnover of wood, non-wood forestry products and woodwork was $7.3 percent, of which wooden exports brought $5.12 billion, up by 7.1 percent over the year before. Hawa’s deputy chair Huynh Van Hanh commented that Vietnamese enterprises obtained two-digit export growth rate this year because they invested in technology and design. Many enterprises expanded their factories and set up more production lines with advanced technologies. Others increased investment capital by two or three times. The moves helped them obtain more orders from importers. In the past, Vietnamese enterprises simply did outsourcing according to the designs given to them. But now, they design new products and export products under their own names. Hanh said modern technologies now are affordable for Vietnamese enterprises, and, even small manufacturers can also install new production lines. With old technologies, every worker can create productivity value worth $20,000 per annum. The figure is $35,000 with new technologies. Huynh Quang Thanh, general director of Hiep Long Wood Processing in Binh Duong province, said he has invested in new technology and set up a design division. The products designed by the company are priced at 10-20 percent higher than products made in accordance with designs provided by clients. Thanks to this, the company usually obtains orders from resorts in the US and Japan, worth $3-4 million each order. In the domestic market, Vietnamese manufacturers are targeting the high-end market segment, which was previously dominated by imports. At some construction works, 80 percent of woodwork is made in Vietnam. According to Hawa, the domestic market grew by 5-6 percent per annum and the consumption is expected to increase to $2 billion this year. Unlike previously, the domestic market is being controlled by Vietnamese enterprises. 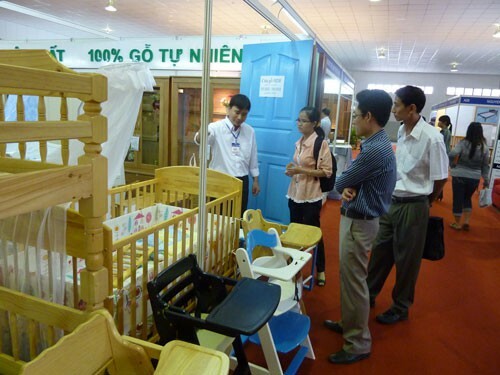 Vietnam only imports $68 million worth of wooden furniture products every year, mostly from China. Imports have become less favored because the products are not as diverse, and they are more expensive.